Bunselmeyer and Duty earn Preseason Player of the Year honors; Lions picked to finish second in LSC. RICHARDSON – The Texas A&M University-Commerce soccer team has been predicted to finish in second place in the Lone Star Conference in 2018, as the annual preseason poll was released Wednesday. The Lions’ Delaney Bunselmeyer has been picked as the Preseason Defensive Player of the Year and Caitlin Duty has been chosen as the Preseason Goalkeeper of the Year. The Lions return 10 of 11 primary starters from the 2017 squad which was ranked as high as No. 9 nationally during the season. 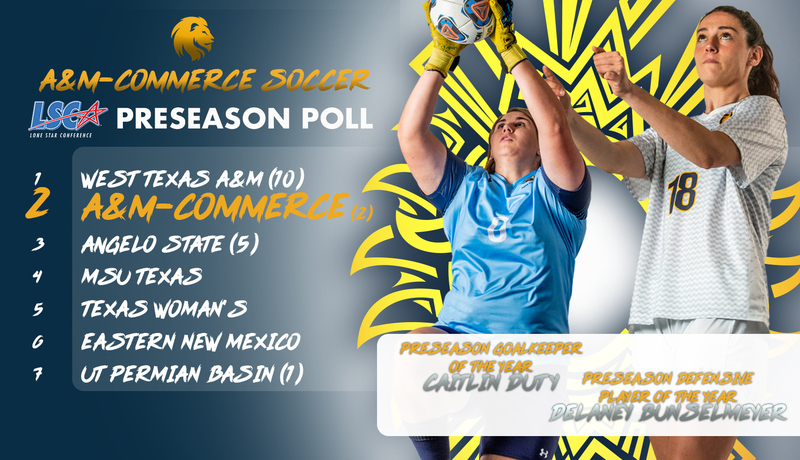 A&M-Commerce went 12-4-3 overall and finished second in the LSC with 25 points on an 8-3-1 record. The Lions advanced to the semifinals of the Lone Star Conference Championship tournament. Bunselmeyer (Denton – Ryan) enters her senior season having played in 62 matches in the previous three seasons, scoring five goals and passing out seven assists. She has played 4,461 minutes at center back and has three career game-winning goals. In 2017, she was a D2CCA Second Team All-America selection, United Soccer Coaches Second Team Scholar All-American, LSC Defensive Player of the Year, USC and D2CCA First Team All-Region selection, earned CoSIDA Academic All-District honors, and was a First Team All-Lone Star Conference pick, leading the Lion defense which led the LSC in fewest goals allowed. Duty (Crandall) earns her second career LSC Preseason Goalkeeper of the Year distinction. The senior is a two-time second-team all-LSC pick, as well as earning LSC All-Academic honors twice. She was a CoSIDA Academic All-District honoree and earned LSC All-Tournament distinction in 2017, earning LSC Defensive Player of the Week honors twice during the year. She led the LSC in fewest goals allowed (15) and save percentage (.842) and was second in the conference with eight shutouts. For her career, she has allowed 30 goals in 42 matches over 3,734 minutes for 0.72 goals against average with 169 saves. She carries a 27-10-4 record and 19 shutouts and the program’s career leader in goals-against average (0.72), ranks third in shutouts and is tied for fourth in career wins. The Lions begin the season next week with a pair of home matches. The first match of the season comes on Thursday, August 30, as the Lions host Metro State for a 3 p.m. kickoff. That is followed by a home match on Saturday, September 1, at 7:30 p.m. against Westminster (Utah). The Lions play nine total home matches in 2018. Season tickets are available at www.WeAreLionsTix.com or by calling (903) 468-8756. Lion Athletics announces the Hall of Fame induction class of 2018. COMMERCE – Texas A&M University-Commerce has announced the five members of the 2018 Lion Hall of Fame class, the Bobby Fox Award recipient and the newest member of the Lion Hall of Honor, who will be inducted on Sept. 29. Former women’s basketball player Kanani Marshal, men’s basketball player Darrell Waters, football player Antonio Wilson, track and field and football player Bobby Bankston and the late Samson Obwocha, former track and field and cross country athlete, will be inducted into the Lion Athletics Hall of Fame. This year’s Bobby Fox Outstanding Alumni Coach Award recipient will be Holly Mulligan, head girls basketball coach at Prestonwood Christian Academy. The Hall of Honor will welcome long-serving team physical therapist Dr. Greg Hulsey. The luncheon will take place at 11:00 am on Saturday, Sept. 29, in the Sam Rayburn Student Center on the A&M-Commerce campus. The luncheon is open to the public with a cost of $30 per person or $50 for a couple. As space for the event is limited, please contact Lion Champions Fund Executive Director Taylor Phelps to RSVP at (903) 886-5554 or taylor.phelps@tamuc.edu. The Letter-Winners Tailgate will begin at 4:00 pm prior to the Lions football game against Lock Haven at 6:00 pm. All letter-winners will be recognized on the field during the game, as well as the Hall of Fame honorees. Membership in the Lion Athletics Hall of Fame is limited to former Lion student-athletes, coaches, and athletics administrators. Student-athletes must have completed their eligibility 10 years prior to nomination, while coaches and administrators must have served A&M-Commerce for a minimum of five years. In addition, the nominee must be a person of such integrity, character, and sportsmanship that the A&M-Commerce family will be inspired by the recognition. The sharp-shooting Kanani Marshal made 242 three-pointers in her career, which to this day is an A&M-Commerce women’s basketball record. She is also the program’s all-time leader in three-point percentage (.405) and steals (214) and is second in free throw percentage and fourth in career assists. She was the first player in program history to be named an All-American and was also the first to be named Lone Star Conference Player of the Year. She was also a First Team All-Region selection and a two-time All-LSC honoree. During her MVP season in 2006-07, Marshal was a major contributor to the Lions’ first-ever LSC Championship and helped lead the Lions to the South Central Regional championship and a berth into the Elite Eight, both program firsts. In his two seasons for the blue and gold, Darrell Waters helped the Lion men’s basketball team to two 20-win seasons and two trips to the NCAA Tournament, including an Elite Eight appearance in the 1996-97 season. During his first season with the Lions, Waters led the team in scoring and earned First Team All-LSC honors. He would go on to lead the Lions to the South Central Region championship and a trip to the Elite Eight. He was named the 1996-97 South Central Region Player of the Year. During his senior season, Waters elevated his game even higher, earning the LSC Most Valuable Player award and Third Team All-America honors from the National Association of Basketball Coaches. He led the Lions to a share of the LSC Championship and another berth into the NCAA Tournament. He was a two-time All-LSC selection and two-time All-Region selection. Waters would go on to have a long professional career in Australia. Antonio Wilson prowled the defensive gridiron for the Lions in his four years at A&M-Commerce and is tied with fellow Lion Hall of Famer Danny Kirk as the all-time leading tackler in program history (348 tackles). Wilson was a three-time All-LSC selection. He had a senior season for the ages, earning Lone Star Conference Defensive Lineman of the Year honors and was named a First Team All-American by five different organizations (AFCA, Associated Press, D2Football.com, Don Hansen and NCAA Division II Sports Information Directors). In addition to being the program’s co-leader in tackles, Wilson is second in program history in tackles for loss and fumble returns, is sixth in career sacks and seventh in fumbles forced. Bobby Bankston was a two-sport athlete for Old ET, playing football in the fall and then competing on the track team in the spring. Bankston was a world-class sprinter for the Lions, winning the 1986 NCAA Division II National Championship in the 100-meter dash in his final race as a Lion, with a time of 10.39. Bankston also had a spectacular junior season at the NCAA Track & Field Championships, earning First Team All-America status in the 100-meters, the 110-meter hurdles, and the 4×100-meter relay. His races helped the Lion men’s track & field team finish as the overall runner-up at the 1985 NCAA Division II Track & Field Championships. Bankston’s time of 14.06 in the 110-meter hurdles, which he set in 1985, still stands as the A&M-Commerce school record. Samson Obwocha was one of the greatest distance runners in East Texas State history, winning four individual National Championships in his two-year Lion career. In his lone season with the Lion men’s track and field team, Obwocha earned the 1985 Lone Star Conference Outstanding Male Track Athlete of the Year award, winning the LSC Championship in the 1,500-meters, the 5,000-meters, and the 3,000-meter steeplechase. Obwocha did not stop there as he made A&M-Commerce history at the 1985 NCAA Division II Track & Field Championships, becoming the first athlete in school history to win an NCAA Championship. He won the individual title in both the 1,500-meters and the 3,000-meter steeplechase and also placed in the 5,000-meters, earning three NCAA All-America awards. His efforts helped lead the Lion men’s track & field team to a runner-up finish overall at the championship meet. Obwocha continued his dominance during the 1985 cross country season, winning the NCAA Division II 10K Championship race by more than three seconds. His time atop the podium would not end there as Obwocha repeated as NCAA Division II Cross Country champion in 1986, this time winning the 10K race by five seconds. These are the only two National Championships in A&M-Commerce cross country history. More than 30 years after hanging up his collegiate cleats, Obwocha’s best times in the 1,500-meters (3:43.35), the 5,000-meters (14:10.60) and the 3,000-meter steeplechase (8:14.17) still stand as school records. After his Lion career, Obwocha continued to race professionally. Lion women’s and men’s cross country predicted to finish fourth in LSC. 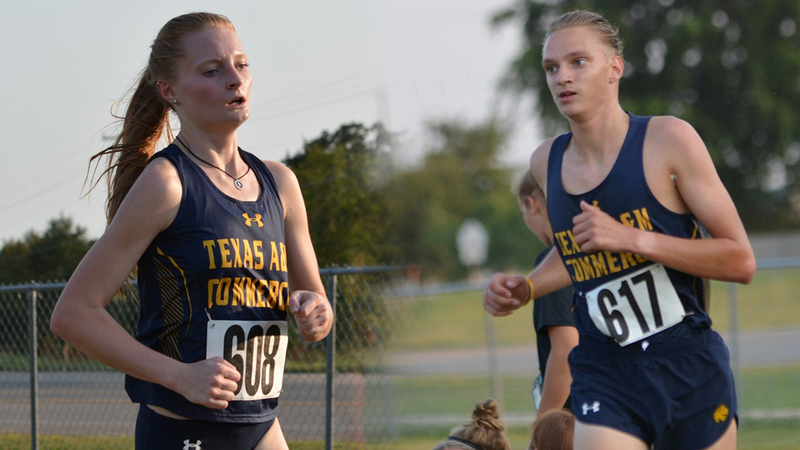 RICHARDSON – The Texas A&M University-Commerce women’s and men’s cross country teams have both been predicted to finish in fourth place in the Lone Star Conference in the annual preseason poll, which was released Tuesday. The women’s team collected 149 points, while the men’s team earned 134 points. The fourth place predictions mirror each team’s finish in last year’s Lone Star Conference Championships. The head coach, sports information director, and one media member from each school in the league vote in the poll. Both squads return the majority of their scorers from the 2017 LSC Championships while injecting youth as well. On the women’s side, junior Brandi Stalder (Sanger) was the top placer for the Lions. She is supported by junior Maddie Shubert (Rowlett), who was an Academic All-LSC selection, senior Mikayla Maldonado (Irving – Nimitz), sophomore Jazmynn Kennebeck (Rowlett), and sophomore Shelby White (Eustace) from the 2017 squad. Returners on the men’s team are led by sophomore Garvin Chilton (Katy) and senior Evan Luecke (Forney). They are joined by sophomore Mason Boswell (Katy), sophomore Daniel Montiel (Katy – Mayde Creek), and senior Sergio Marcuello (Cuenca, Spain). Marcuello is in his first cross country season with the Lions but placed fourth in the 10,000-meter run at the Lone Star Conference Outdoor Track and Field Championships. The Lions are set to compete in four regular-season races in 2018, starting the campaign by hosting the East Texas Shootout at Centennial Park on Friday, September 7. The 6-kilometer women’s race is set to begin at 5:45 pm, followed by the 8-kilometer men’s race at 6:45 pm. 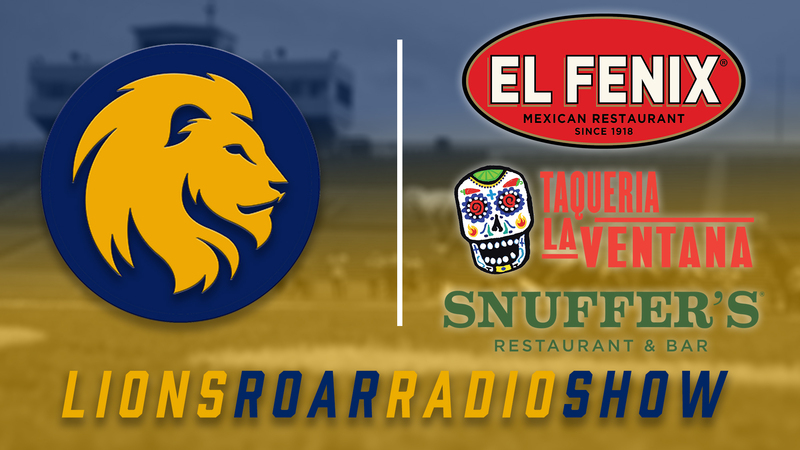 LIONS ROAR Radio Show to resume Monday nights at El Fenix, Taqueria La Ventana, and Snuffers in Greenville. 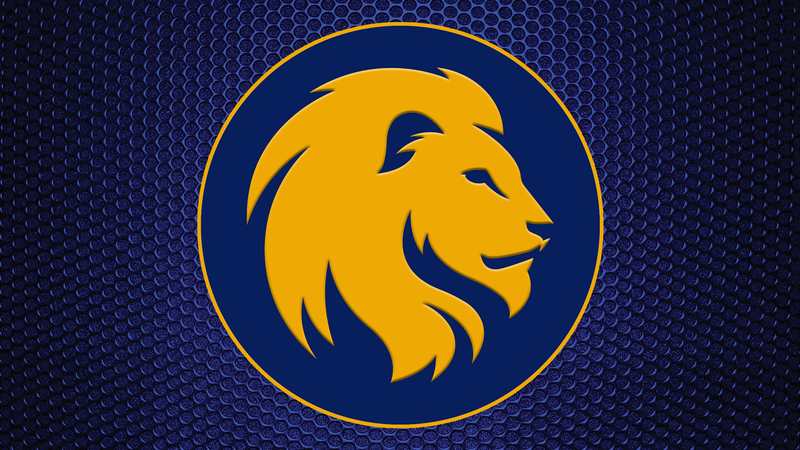 COMMERCE – Texas A&M University-Commerce has announced the schedule and location for the LIONS ROAR Coaches’ Show for the fall semester. This semester’s show will be hosted by Lion Athletics at the Greenville locations of El Fenix, Taqueria La Ventana, and Snuffer’s. The show will take place LIVE on Mondays at 6 p.m. with various Lion coaches, student-athletes, and administrators. Lion Athletics will broadcast the video live on Facebook each week at Facebook.com/LionsAthletics. The show will be re-broadcast on the Lion Sports Network on KETR-FM 88.9 each Wednesday night, as well as prior to Lion Football and Basketball broadcasts. The audio will also be available as a podcast on the Apple Podcast store. El Fenix, Taqueria La Ventana, and Snuffer’s are all branches of the Firebird Restaurant Group, which is a proud partner of Lion Athletics through Lion Sports Properties. The show will rotate between the three restaurants on a week-to-week basis. The restaurants are located adjacent to each other on the northwest corner of the intersection of Interstate 30 and Texas Highway 34 (Exit 93, Wesley Street). Each venue will have various food and drink specials during the show for Lion fans. The show will be hosted weekly by Associate Athletics Director Josh Manck. The fall schedule is listed below, with the winter and spring schedules to be released at a later date.